Someone tired to steal my tiny house this morning. If you want to hear the whole story, I posted it here. However, the bottom line is that they did not get away with the house and I am extremely thankful to God for watching over it and us. Here is the short, but meaningful conversation I had with God after the incident.Me: thank you, God. All I can say is thank you. I know it was my neighbor, Will, who was physically watching the cameras this morning, but I also know the real reason he was watching was because of you. 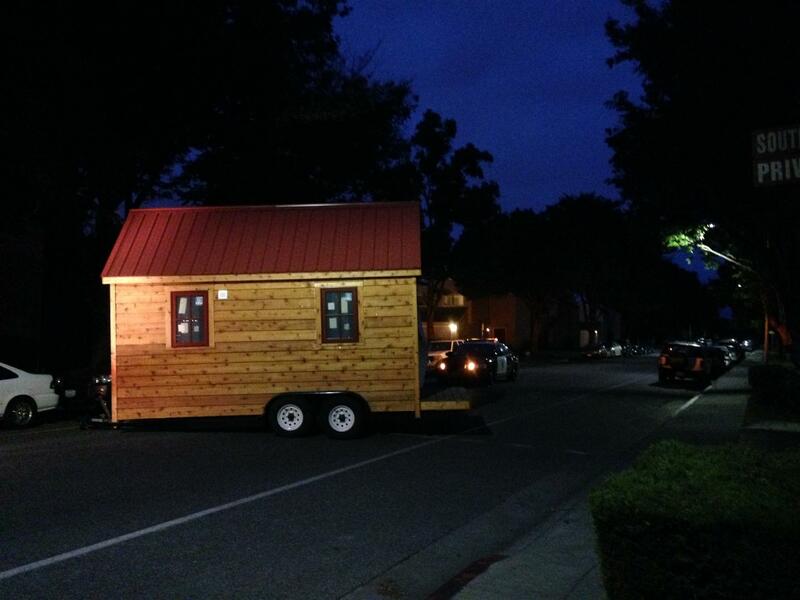 God: you have worked too hard on this tiny house for me to allow it to be taken away from you easily. I’m sorry this had to happen at all, but you should also know that what happened this morning is going to be used for a larger purpose. There’s more at stake here than just your tiny house. Me: I figured as much. God: Lots of people’s lives will get better because of what happened this morning, including your own. Me: Actually, I have already thought of a couple good things that might come out of this. First, this might be the careless mistake that actually allows the police to catch these people. Second, I think it will be a wake-up call to our neighborhood to take security a little bit more seriously. Finally, the damage to my trailer is going to require me to bring the tiny house over to Orlandi trailer to get it fixed and in the process, I was thinking that maybe they could move my trailer winch to a different location so I would have more room to build a container box for my batteries and propane on the front of the trailer. I was also thinking they could install propane tanks and lines so that I don’t have to deal with that later. God: I really like the idea of you allowing somebody to help you with the propane lines. It was making me nervous that you were thinking about doing that yourself. Me: I know. It was kind of silly. I keep trying to do everything myself instead of accepting or getting help. God: Maybe Orlandi can help you with a security system for your trailer as well. Me: That’s another good idea. See, lots of good things might come out of this.God: One of the things I do best is to transform bad things into good things for those who trust and allow me to do so. Me: I have to admit that you are quite good at that. Thank you again for taking such good care of us today. I’m so grateful that you are part of our life and that you are always watching over us, even when we are sound asleep and don’t know you’re there. This entry was posted in Uncategorized on May 22, 2015 by russellstevens2014.